Great excitement surrounds Caribbean cruises from Baltimore. While the Baltimore Port has a long way to go to catch up to the more popular cruise ports in Florida - such as Port Canaveral and Miami – there is a sufficient serving of Caribbean cruises sailing from the Baltimore Port. In some cases, you can even find year-round cruise itineraries from Baltimore. Two major Caribbean cruise lines offer cruises from Baltimore: Carnival Cruise Line (the world’s most popular line) and Royal Caribbean International. Carnival has one ship, Carnival Pride, sailing from Baltimore, and so does Royal Caribbean - Grandeur of the Seas. To a great extent, Caribbean cruises from Baltimore include ports of call in the Bahamas. 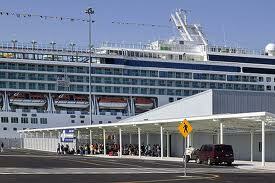 However, you can also find Eastern Caribbean and even Southern Caribbean cruises leaving from the Baltimore Port. Finally, you will also find cruises to Bermuda from Baltimore. While Bermuda is not considered the Caribbean, it is not too far located from some Caribbean islands. Royal Caribbean offers cruises from Baltimore to Bermuda. Cruise itineraries from Baltimore to the Bahamas will get you to ports such as Cococay (Royal Caribbean’s private island); Half Moon Cay (private Bahamian island shared by Carnival and Holland America Cruises); Freeport and the most popular Bahamian port of call, Nassau. Eastern Caribbean itineraries from Baltimore include ports such as Roseau, Dominica; Charlotte Amalie, St. Thomas, USVI; and Philipsburg, St. Maarten. Southern Caribbean cruise itineraries will get you to ports such as Castries, St. Lucia; Basseterre, St. Kitts; and Bridgetown, Barbados. 1. Carnival Pride offers 7-day cruises to the Bahamas, with stops at Port Canaveral, Florida; Nassau and Freeport. 2. Carnival Pride also offers 7-day cruises to the Eastern Caribbean with stops at Grand Turk, Turks and Caicos Islands; Half Moon Cay (Little San Salvador Island) and Freeport, Bahamas. 1. Grandeur… offers 5-night cruises to Kings Wharf, Bermuda. 2. Grandeur… offers 9-night cruises to the Bahamas, with stops at Charleston, Port Canaveral and Miami and then to Nassau and Cococay (Little Stirrup Cay), Bahamas. 3. Grandeur… offers 11 or 12-night cruises to the Southern Caribbean, with stops in ports such as St. Maarten, Roseau, Dominica, Bridgetown, Barbados and Castries, St. Lucia. Note: The itineraries above are subject to change, as Carnival and Royal Caribbean re-position their ships. Now that you have an idea which cruises are available from the Baltimore Cruise Terminal, you also need to know how easy it is to book Caribbean cruises from this port. 1. Call your Travel Professional to book your cruise. 2. Use the Search Box below to find and book your cruise. 3. Visit our website, PetesTravel.com (Petes Travel Center) and book it there. 4. Call the respective cruise line to book. So, did you catch the excitement? Your family is sure to find one of several exciting Caribbean cruises from Baltimore. When you return, be sure to share your Caribbean cruise story with us. Thanks.